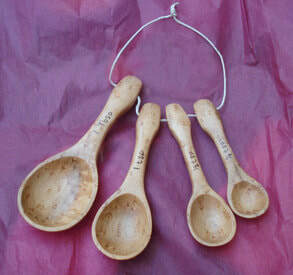 These spoons are made for stirring! Or sautéing, folding, mixing, beating and blending! Wooden Spoons and Spatulas, too, won't harm a non-stick surface and even sound good in the pan! And if you maintain them (easy, I promise)*, they'll become even more lovely over time. 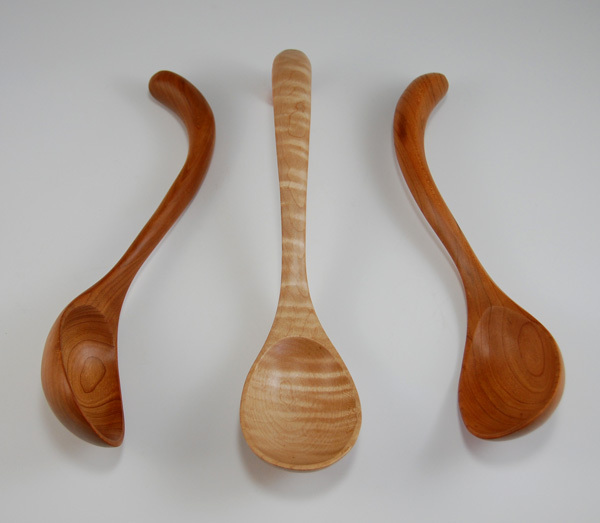 Tip from a favorite customer: Try holding your spoons in different ways--like a sword or like a pencil. 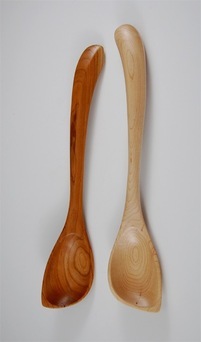 Shown: Medium Chef's Spoon in Cherry, Large Chef's Spoon in Curly Maple. Both with Grip Handle. The Traditional Choice of many cooks (including my grandmothers) for stirring sauces and blending ingredients. 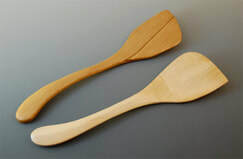 With a round, shallow bowl and a flattish, oval handle, these spoons won’t twist in your hand while mixing a stiff batter. My personal favorite. If I only want to dirty one spoon when making a meal—I grab this one. It sautés onions and garlic, scrapes the bottom and sides of a pot of pasta, and gets into the corner of a deep pot of sauce. Then doubles as a tasting spoon. 13.5" x 2.5" x 1"
A wonderful little server or stirrer. My favorite for sautéing onions, then adding eggs for a scramble. A thoughtful “First Kitchen” gift. ​Available with smooth or twisted handle. Oh, so lovely for an elegant dinner party, dispensing vegetables, chili or gravy. The handle drapes gracefully over the lip of your serving bowl. Labeled and Accurate! These are so wonderful to use, SO hard to make true to size. I won’t bore you by describing the process I use. I used to wonder why no one else made these of wood. Now I know. 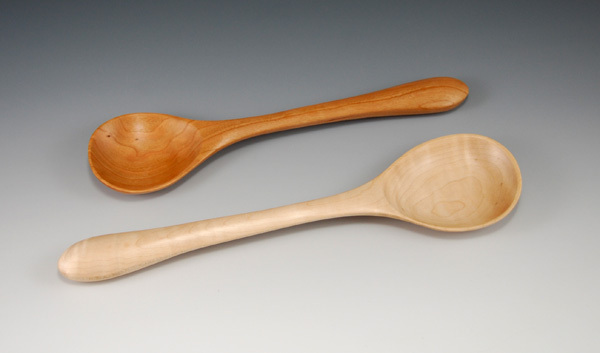 Measurements (1TBS, 1tsp, 1/2 tsp & 1/4 tsp) are wood-burned on, so they'll never wash off. From 5" x 2" to 3.75" x 0.75"
Bring a touch of color to your kitchen! 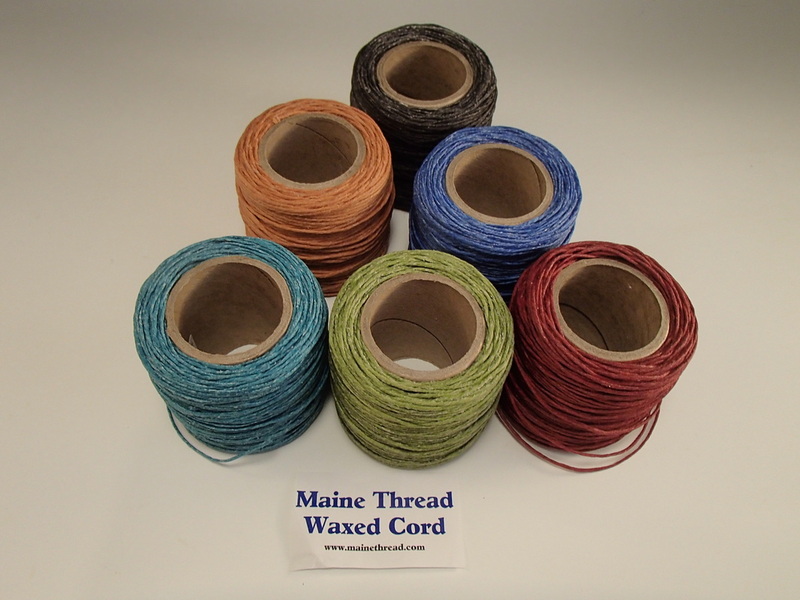 Add colored cord to your measuring spoons! Hand braided by yours truly, I’ll gladly replace the cording on your Meb's Kitchenwares spoons. Just bring them to a show or send them to the workshop.